Prince Abu is a Michigan smasher who is widely considered to be one of the best Jigglypuff players in the world. He has notable wins over top players such as Shroomed, ChuDat, Westballz, DruggedFox, lloD, S2J and Plup. He has teamed with Duck in several recent tournaments. 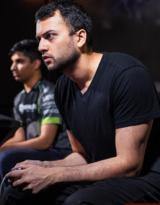 He is currently ranked 77th on the 2018 MPGR and was formerly ranked 2nd on the Chicago Melee Power Rankings. On February 28th, 2016, he was signed by Glacial Gaming. There exists a significant statistical correlation between Hungrybox's losses vs. Armada and Prince Abu's presence at a tournament, (due to Prince Abu being available as a practice partner) which has been termed by some as "The Prince Abu Effect". Armada has commented on this, calling Prince Abu "[his] hero" for helping him to prepare for the Jigglypuff matchup. Contrary to popular belief, Prince Abu has tech skill comparable to that of other top players, most notably with Fox and Falco. This page was last edited on March 14, 2019, at 00:52.